Happy New Year, y'all! Our first post of 2018 is a good one. We'll continue to share our fall 2017 weddings over the next few weeks, and we can’t wait for you to see them all! This wedding from November was so lovely! We loved their color palette and all of their dreamy, romantic details. Plus, fall was in full swing at The Barn that weekend, and their details combined with the fall leaves were absolutely beautiful. This was our first time working with Kelly Glaze Photography, and we truly LOVE her work. She did such a gorgeous job on these photos! Y'all will adore this one. Hailey and William were married at The Barn at Twin Oaks Ranch on November 11, 2017. 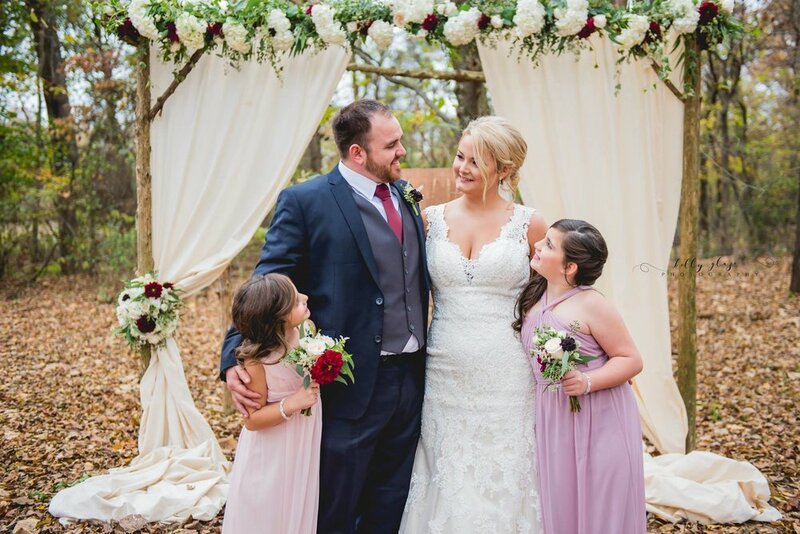 Their burgundy and blush color palette was gorgeous - adding a rich shade like burgundy is the perfect way to use pastels in a fall wedding! Every detail of this wedding was dreamy and romantic! Hailey's beautiful dress came from Low's Bridal, and we're totally swooning over it! This dress was amazing from every angle, with its stunning silhouette and incredible lace details. Hailey, you are gorgeous! We're forever into mismatched bridesmaids' dresses, and these from David's Bridal were sooo pretty. We loved the colors these girls chose, as well as the different necklines. This was such a pretty bridal party! Barn florals are always amazing, but these were just the BEST. Hailey chose flowers in shades of deep red, blush and white, with loads of greenery. I LOVE the natural, undone look of Hailey's bouquet... seriously the "it" bouquet of 2017. "The bouquets were stunning!" Hailey said. "So intricate, but delicate at the same time. They truly accented our gowns beautifully." Hailey and Will shared a first look before their ceremony, and the photos of these moment are the sweetest. Will's reaction to seeing his beautiful bride was precious, and you can truly see how happy these two are together in these photos! Hailey and Will's ceremony details were simple and romantic. Their altar included an elegant ivory drape and white flowers across the top, with the prettiest greenery and pops of deep red. Their aisle was lined with wire sconces filled with small floral arrangements. Their details were kept pretty simple, but with the stunning fall leaves covering the ground, they didn't need much else! 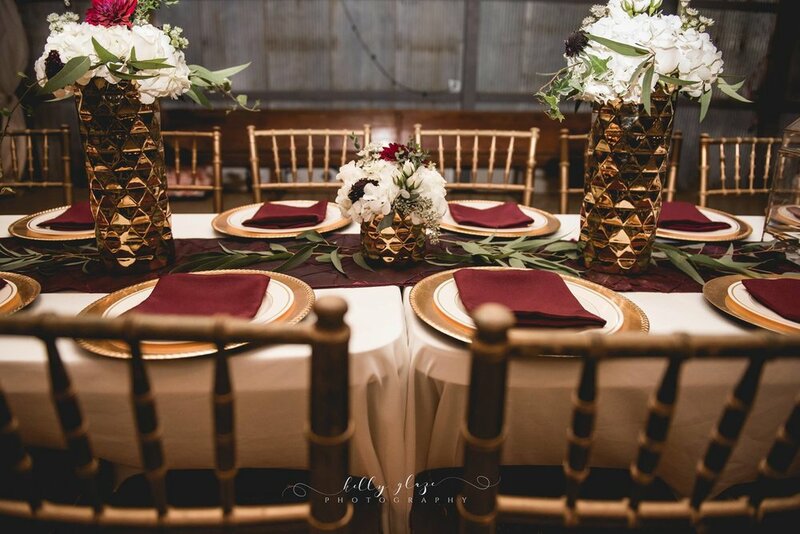 "The flowers/decor were my very favorite details," Hailey said. "They stood out and made everything look so put together." Hailey and Will's reception was elegant and GORGEOUS. Their tables included white tablecloths, burgundy table runners, florals in gold vases, and candles in gold lanterns. I LOVED the thin greenery garlands running down the middle of their tables. And I also adored their super elegant table settings... those burgundy napkins were the icing on the cake! As if these tables weren't pretty enough, the lighting and draping in The Barn totally set them off. Such a dreamy reception! I'm obsessed with Hailey and Will's wedding cake! Cakes that are not-quite-naked and not totally frosted are SO pretty, and the florals on this one made it extra amazing! Another super cute reception detail: these personalized stadium cups that the newlyweds sent home with their guests! When I asked Hailey to give us some feedback, she simply said, "The team was wonderful! So great at making dreams come to life!"